Shooter Job-4 info about the game-Games2Rule. Shooter job-4 is the fourth stage of training in WPF (world protection force). In this stage you want to take a sniper gun shoot training in target boards. The training was, the terrorist hijacked the buildings, and you have to rescue the people. Shoot the target board (terrorist) in the buildings which is in orange mark. Don�t shoot the full black target board (civilians) it will reduce your points. Achieve the target points within the given time duration to move further levels. 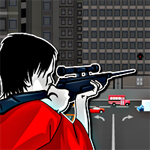 Get more points in Shooter job-4 to achieve a best sniper shooter in this training. Good luck for your shooting job.